Soho Honey Book One by A.W. Rock is available at Amazon and all good book stores. Noelle Mouska, our French agent of the Alnovas agency, will be attending the Turin Book Fair in May. The Salone Internazionale del Libro di Torino returns every year to Lingotto, the famous Fiat plant with the spiral ramp and roof-top test track, where the original Italian Job was filmed. Last year there were 276,000 visitors and over 1,200 exhibitors, 1,400 events and more than 2,000 authors and guests. A.W. Rock is currently working on Soho Honey Book Two. His debut novel Soho Honey Book One is dangerous, seductive and highly addictive and the perfect next read for fans of serious crime thrillers. French agent attends key book fairs. Noelle Mouska, our French agent of the Alnovas agency, has been to the Berlinale, the London Book Fair, the Paris Book Fair and she will be at the Turin Book Fair in May. Posted on April 7, 2017 April 19, 2017 Author StudioNashCategories Soho Honey Book OneLeave a comment on French agent attends key book fairs. Soho Honey visits the London Book Fair Today. It has been an enjoyable day at London Book Fair. The event takes place every year. Posted on March 16, 2017 Author StudioNashCategories Soho Honey Book OneLeave a comment on Soho Honey visits the London Book Fair Today. The Co-Production Market takes place 12 – 15 February. We’re looking forward to getting in touch with the film world! A.W. 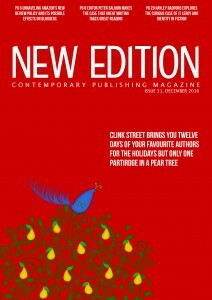 Rock features in Authoright’s quarterly publishing magazine, New Edition. The article shares their writer’s resolutions for the new year! See below. My New Year’s Resolution by A.W. Rock. Resolution (dictionary definition): a decision to do something or to behave in a certain manner. I make resolutions on a daily basis – I resolve that I must work and achieve a certain amount – but these decisions inflict pressure to get it done, and I ask myself if this is constructive? A New Year’s resolution can involve both psychological and physical commitments. It might be a mental promise to be less selfish. Or a physical pledge to exercise every day. Whatever the undertaking, how long is it possible to maintain a New Year resolution? A day, a week, a month, or the whole year until the next year’s decision? What is the value of a New Year’s resolution if the resolver does not keep it? The outcome is nearly always failure – so what is the point? Is the failure to keep it up a failure? Or is it acceptance of being human and fallible? This year my resolution will be not to make a New Year’s resolution in the fear that I will not keep it. With no resolution to fear. 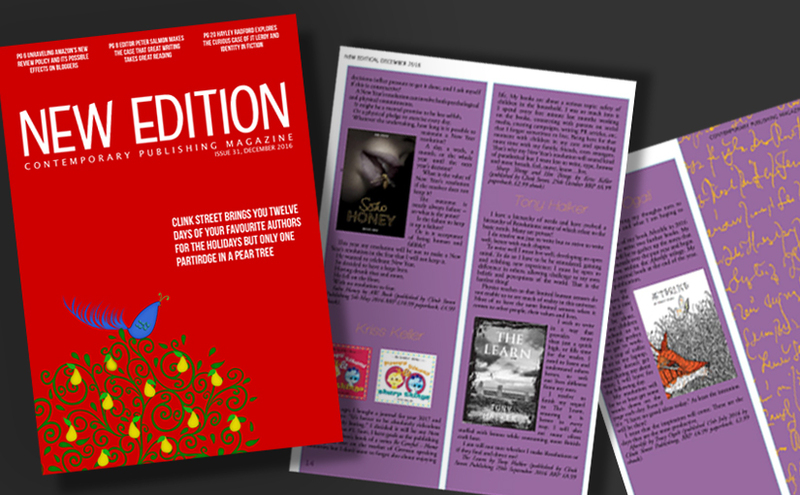 Issue 31, December 2016 of New Edition, Authoright’s quarterly magazine for authors. 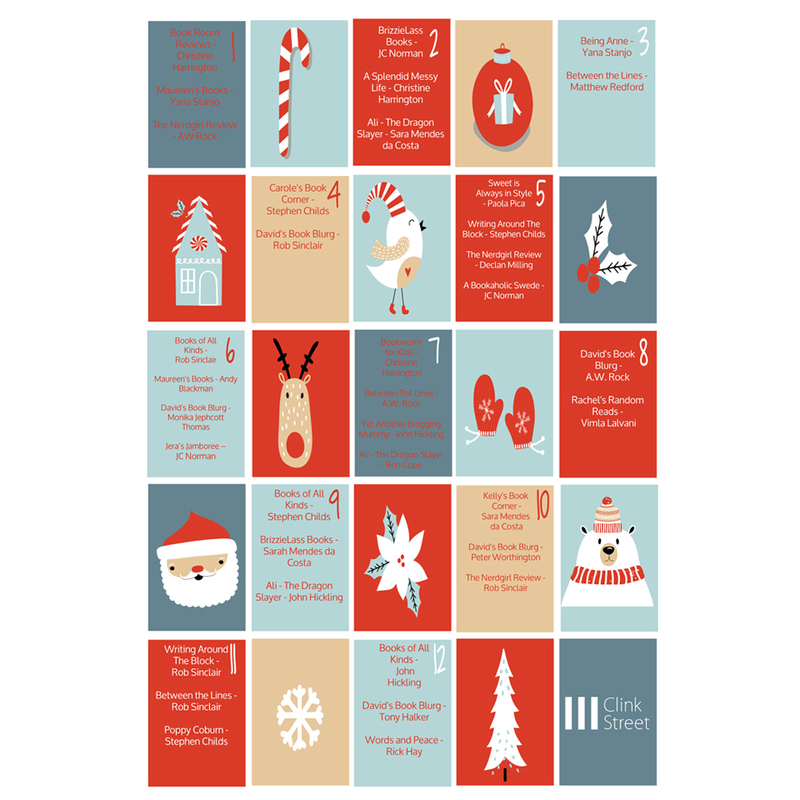 Clink Street Publishing get together with some of their favourite authors and bloggers to bring readers the first 12 Days of Clink Street event. Featuring interviews, original short stories and more. 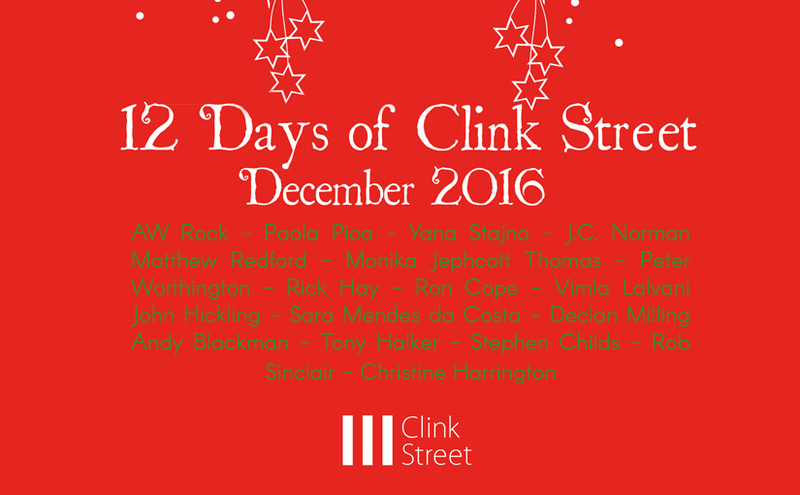 Starting today, Clink Street are teaming up with some of their favourite authors and bloggers to bring readers the first 12 Days of Clink Street event. A.W. Rock will be taking part sharing his second short story and Soho Honey his debut novel will feature in the Bloggers reviews. Be sure to follow along and share the good cheer far and wide this holiday season!